Short breaks & gift ideas	From 1 day & 1 night, can also be combined according to your preference! From 1 day & 1 night. For a stronger skin, radiant with health. COMBINE YOUR WEEKEND SPA PACKAGES IN vICHY ACCORDING TO YOUR PREFERENCE! Looking for a short break in Auvergne (France)? 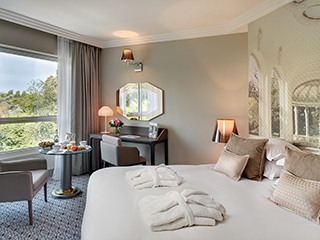 The VICHY CÉLESTINS SPA HÔTEL (Vichy - France) offers you more than 16 weekend spa packages for a romantic stay, a holidays with friends or family, or a single retreat! A perfect place for a relaxing stay in a upscale Spa Hotel and for nature, opera or golf lovers. If you are looking for a romantic break or a special anniversary celebration for couples package, our team will organize you an ideal stay. Just relax and let go during your weekend in Auvergne, we will take care of the details (room, treatments, meal plan, leisure, ...). We invite you to combine our weekend spa packages in Auvergne according to your preference! Looking to offer a weekend spa package and receive a gift voucher? Please specify it in your booking by phone.